Guinea pig is Ecuador is one of the traditional foods you should try while visiting Ecuador, Bolivia or Peru. It is more commonly known as cuy (kew-y) in the indigenous language of Kichwa, because of the high-pitched bird-like sound the animal makes. 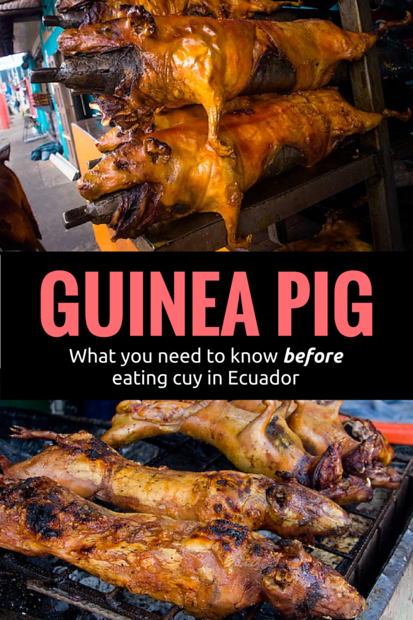 Many people wonder why Ecuadorians eat guinea pig and it’s because guinea pigs were the main source of meat before cattle were introduced to the country. The number of cuy became a status symbol because it meant you had enough money to eat meat. It was never an everyday meal but a luxury. It is much larger than what we know as a guinea pig in North America and it about the size of a rabbit. While many travelers think eating guinea pig is gross, I don’t think you can really judge if you eat meat of any kind. Guinea pig tastes like chicken? The taste of guinea pig is difficult to describe and depends on how it is cooked. In Ecuador it is often cooked over an open spit; it reminds me of chicken wings or some other kind of dark meat. I ate guinea pig again again in Cuzco when a Peruvian friend took me to a local place to eat so much meat I didn’t eat again for a full 24 hours. It was deep fried and I had to admit in the cuy wars, Ecuador won the best preparation test. As deep frying it seemed to enhance its already pronounced greasiness. Trust me, it really does matter how you cook this animal. Where to eat guinea pig? Guinea pig can be found in the Andes of Bolivia, Peru and Ecuador. Although Colonial Cuenca is known as one of the best places to eat cuy, my first time eating cuy was in Baños with my mother and sister. Surprisingly my sister really liked it. But my mother once had a pet guinea pig and the sight of little feet on her plate turned her stomach. After Banos and Peru, I had to go back to Cuenca famous for its cuy and I had never been. How to eat guinea pig? It seems like a strange question to ask but most people try to eat guinea pig with a knife and fork. Don’t worry about being polite, just get in with your hands and eat it like chicken wings. I must admit it wasn’t the best, as it had a really strong flavour. But I have heard the age of the cuy changes the flavour dramatically. And while I can’t say I loved it, I know I’ll try it again. « Is tourism killing the Galapagos? Funny, my last post was about eating cuy in Cusco… I have to admit that my reaction was similar to your mother’s. That said, my 11-year-old kid devoured not only her entire cuy, but started in on mine… You’re brave to try it again! Not sure I’ll ever be up for it again, although I’m glad I tried it. Maybe it’s just the perspective of the photos and video…. but those look like some massive guinea pigs– much larger than anything I ever had as a pet growing up! I can’t believe your mum was put off by the feet. They’re the best bit!! I didn’t post the video we made of me chewing on paw (con mis manos) because it’s a bit too gruesome! Well travel is all about new things. You have achieved that! Here in the Philippines we also have roasted suckling pig it called “Lechon”. Every birthday, family occasions and corporate parties has it on their menu. 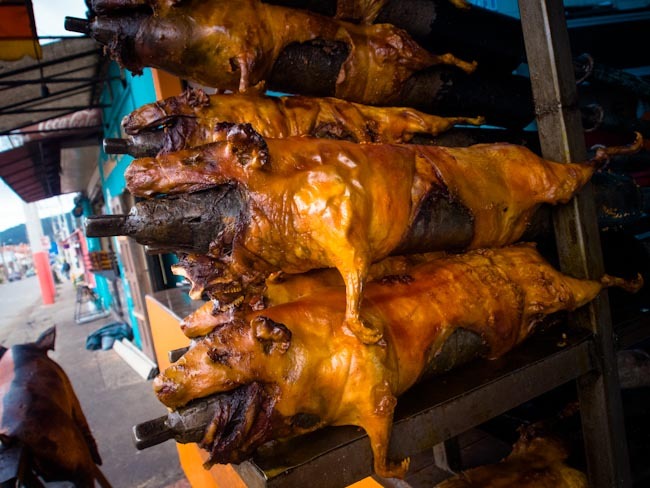 Yes I have had lechon in the Philippines, they have it here in Ecuador as well – although guinea pig isn’t as good. Mmm. Cuy! That looks better than the Peruvian deep fried guinea pig. I preferred having a fancy schmancy restaurant take the guinea pig and make something adventurous. But I’m lazy, eating around the little bones drives me crazy! I’m with your mom! Can’t get past my childhood pet guinea pig! Loved the article though! I like the logo in the video. The videos were cute, not sure I like watching people eat but it was funny. I will have to try cuy whenever i make it to south america. Are these giant cuys or is it just the perspective of the photo? They look massive. When I had cuy in Ecuador they were much smaller. Loving your videos — what camera do you use? And what about editing software / how do you write over the video? On this video I used an Olympus OM-D E-M5 mirrorless camera and I used Adobe Premiere Pro for both the editing and the text. eeeekkkk!! We had many chances to eat guinea pig during our travels in Peru but I just couldn’t bring myself to try it! I love to eat different meat foods. I had get chance to test various items. But not ate at this . Thanks for shearing this article. That’s okay cuy it’s not pig but guinea pig. OMG, those are roasted pigs? They look tasty, but now I need to eat only veggies and fruits with some meat and chees. Piggy is good looking, but …maybe next time. Sorry i am vegetarian so i hate this pic!! That’s okay I can understand how it’s not for everyone. Lechon is the best. So good. Even the skin is just enough to send you to heaven. in Ecuador – Bacon is Magic <Liked it! Interesting! I’m always amazed to see the kinds of food in other countries. We’re pretty boring in North America I think. I ate Iguana in Colombia. We shot one out of a tree and the cook at one of the military bases cooked it for us in a sort of Tomato sauce, It was delicious. On a cruise to the Caribbean ,I even tried snails (Escargot ) but they tasted sort of muddy. I won’t try them again. I will eat anything once. Up in the hill country, they say if it has a name it’s a pet, If not it’s food.